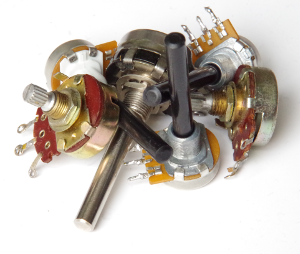 For many electronic projects you need potentiometers with very fine adjustment range. But sometimes you need a coarse adjustment instead. Now what happens if you need both at once? This is for example the case for many regulated laboratory bench power supplies and the standard approach is to use high precision 10-turn-potentiometers which are cheap and economic, but sometimes hard to find in the desired resistance. Another drawback is that they don't allow to turn down the setting very fast if panic is at hand. Every person that worked with high power supplies learned sooner or later that things burn up quite quick at high Amperes or Voltages and you might run into the case that you have to shut down the voltage or current limit very quickly. A possible solution is to add separate coarse/fine potentiometers stacked in serial (or I-shape connection). You can use standard (linear) potentiometers which are cheap and available in many different resistances. 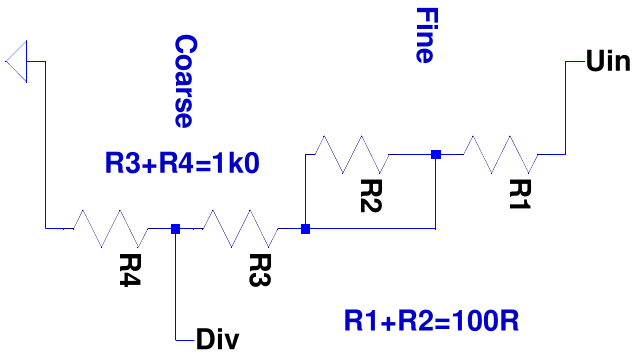 The typical coarse/fine arrangment has the drawback that the influence of the fine resistor is zero at one end of the scale and the total resistance of the serial arrangement varies by the amount of the fine potentiometer (I used an example with 1k1 total Resitance and approx 10:1 coarse/fine ratio. The total rsistance for this examples varies from 1100 Ohm to 1000 Ohm, depending only on the fine potentiometer setting (note that R1/R2 and R3/R4 model the contrary halves of the potentiometers in these example schematics). You can see easily in the chart below that this configuration has a nice fine regulation range of approx. 10% at the upper end but zero at the bottom end. 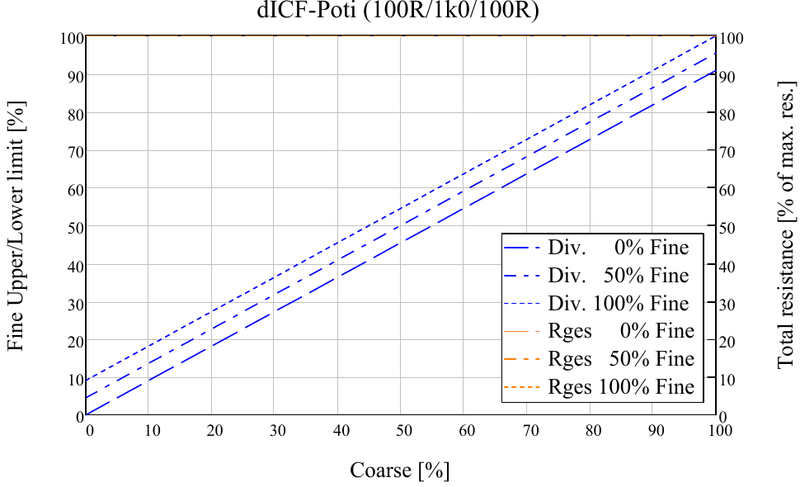 The blue lines depict the voltage at the div(ider)-output in relation to the input voltage for 0%, 50% and 100% fine setting over the coarse setting (in percent). 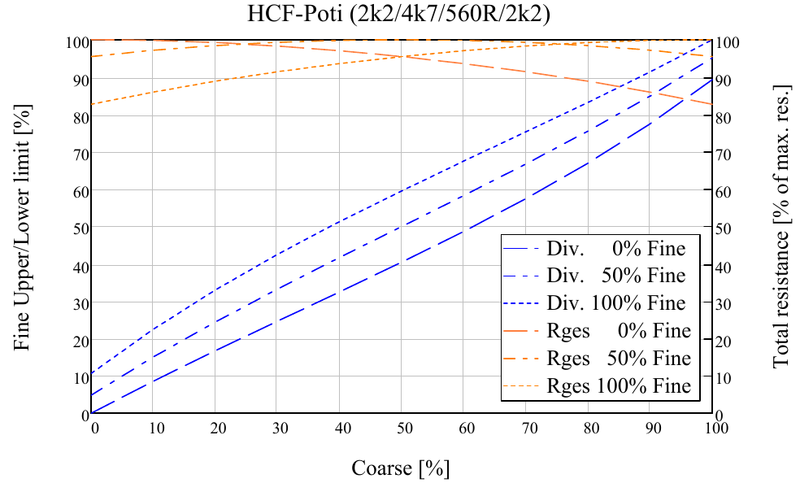 The orange lines show the total resistance of the configuration for 0%, 50% and 100% fine setting. As also other poeple faced this problem, there is a perfect solution for this problem. 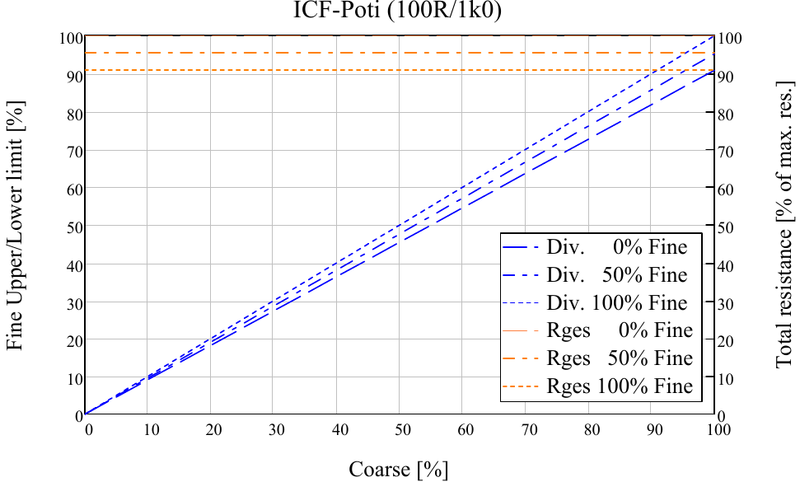 As Jonathan G.Thwaits published in his [blog] you can make a perfect 10% fine adjustment using a dual gear potentiometer for the fine part and connect one gear on top of the coarse potentiomer and the inverse half below. The total resistance does not even vary with this ingenious approach. The only drawback remains in the price and availability of dual gear potentiometers. If you want to avoid the problems of price and availability of dual gear potentiometers, there is a solution by putting standard (single gear) potentiometers in a H-shaped configuration. 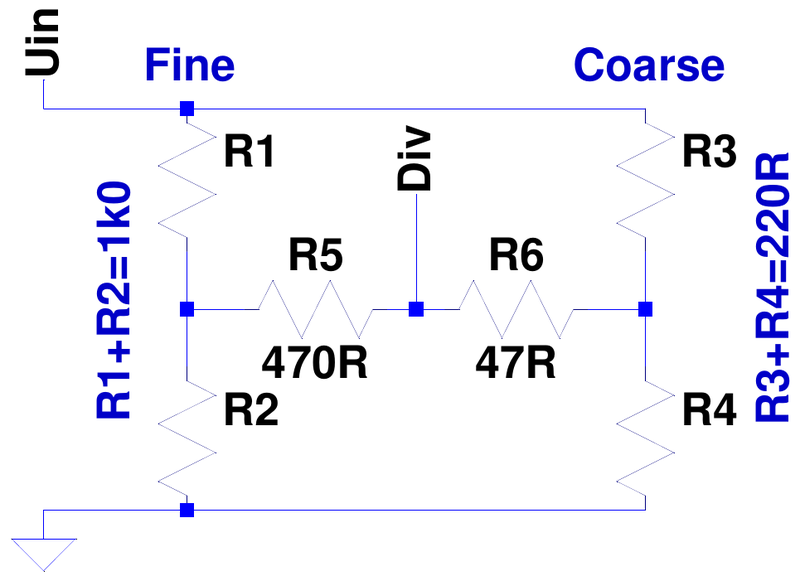 The drawback with this connection is that the total resistance varies unlinearly (from 1100 Ohm down to 910 Ohm for this example) but if your schematic is insensitiv to the total resistance, this should be a possible way to go. (Note that R5/R6 are fixed resistors and no potentiometer). 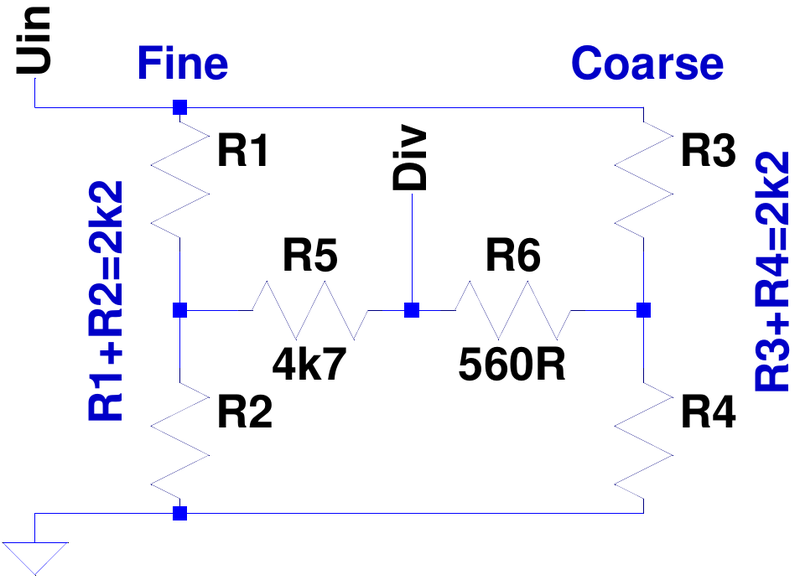 The same method was used for current limiter fine adjustment but with changed resistor values. The total resistance is 180 Ohms, varying down to 134 Ohm in the extreme settings. 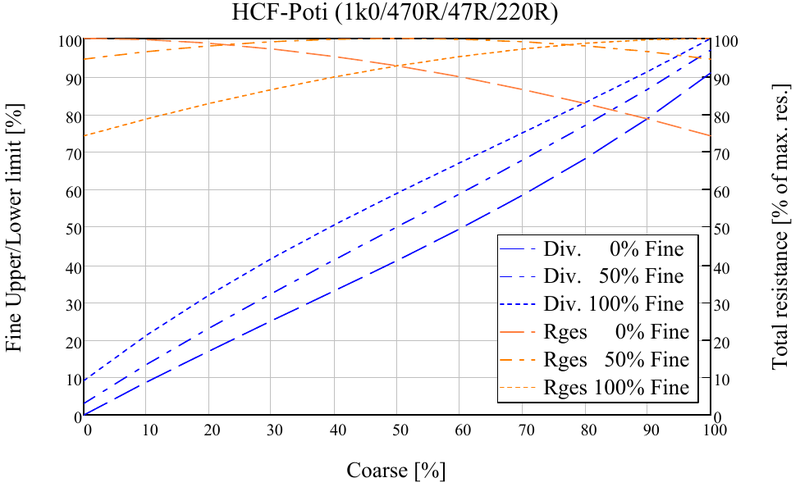 The divergence between the calculation and the measurement stems probably from the other parts connected in parallel to the potentiometer H-shape.